I have Makita 2030 parts for sale! Edit: Everything is sold out! Thanks for looking and feel free to ask if you have any questions. Well, it’s official – while restoring my Makita 2030, I accidentally destroyed it. Despite my ever so gentle jacking up of the main bed to remove the unit from its columns, the bed just disintegrated. Because of that, I now have a ton of Makita 2030 parts up for grabs! You name it, I’ve got it. I’ve included a link to a few pictures, just for reference, including a picture of the main bed for those who are curious. Make a request, make me an offer, and I’ll send it to you plus the cost of shipping. Payment via USPS money order (ut has to be verifiable, I won’t accept something that’s not) or Paypal works. I’ll update a list of what’s gone as it goes. This thing ran like a champ before I killed it – all to try to give it a paint job. What’s gone (part number in parentheses). If it’s not in this list, I still have it. Except the bed. That’s dead. The main things I need are the chain Tensioner, rollers, and maybe the chain cover. I need to check and see how much it is to get the rollers recovered. How much would you be asking for those items. I’d recommend Western Roller for the roller recovery, they’re the best price I found (About $200 for both) and they get glowing reviews from everyone I’ve talked to. I have both roller cores and they’re in great shape; however, the roller material, as you can see, is trashed. 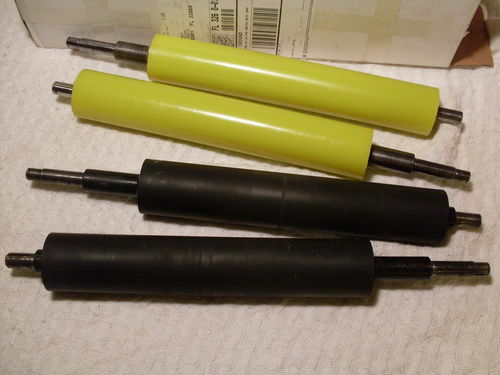 How about $20 a pop on the roller cores, for a total of $40 for both? I’ll even pry the old gunk off for you. For the tensioner, just to make sure, are we talking part number 163112-1? If so, I’d ask $30 and I’ll throw in the retaining clip if you need it. You’ll still want to get a new spring, I’m 99% sure this unit still has the original. I’ll get you the price of shipping from the USPS, UPS, or whatever is cheapest. I won’t mark you up on shipping because 1) that feels skeezy and 2) I have boxes coming out of my ears. As for the tensioner spring, you can still get them new at places like ereplacementparts.com for a few bucks. That would be Chain cover A (part number 164459-6) the outer cover. I Know I can get that new for 20 dollars. I already priced that one. I am good with the rest of the prices $40 for the rollers and $30 for the chain tensioner. MrUnix, I’m not sure if you saw it but I posted to you on another post asking where you got your chain tensioner. I guess you can ignore that one. I just read what I posted last night and realized I was not clear on the cover. Sorry about that. I am still interested in the cover Part number 164459-6 (the outer cover) which I believe is Cover B. Will you take $10 for it? Also is there a washer that goes behind the tensioner assembly? Does it go washer, tensioner, C-clip, main drive sprocket, then C-clip? Or just tensioner, C-clip, main drive sprocket, then C-clip? 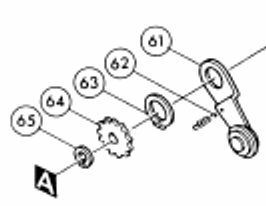 Looking at the parts breakdown there is item number 27 Flat Washer but it is under illustration “B”. I think it goes on the inside of the main assembly but I am not sure. Also is there a washer that goes behind the tensioner assembly? Looking at the parts breakdown there is item number 27 Flat Washer but it is under illustration “B”. I think it goes on the inside of the main assembly but I am not sure. Thanks. It was E Replacement Parts but your picture is much clearer than what I was looking at on line. Sounds like the whole washer situation is hashed out! Do you need the c-clip for the tensioner? I’ll throw it in for free if you do. I have a 2040 I’m rebuilding (eventually) I’ll have to see if the parts I’m missing are the same as on the 2030. Thanks, I could use the c-clip. Are you good with $10 for the cover? Oops, I forgot about the cover. How about $15? Either way, I’ll take a look tomorrow and see if I can make this all fit into a flat rate priority mail box; it’ll be a fair bit cheaper that way. I’m not sure if you’ll need them but I’m throwing in the woodruff keys (254001-2) and c-clips (961052-5) for the rollers. Are you good on plane bearings (214152-3), metal covers ( 341685-6 and 343844-8), and sprockets (221503-3) for the drive rollers? I have everything but the pan head screws for the roller assembly (a few got chewed up so I tossed ‘em). The story behind my planer is I picked it up dirt cheap because somehow a previous owner brock off the sprocket end shaft on the left roller. He gave the machine to someone that then sold it to me to rebuild. He was not sure how it brock off. Because I was missing the chain, sprocket, and tensioner I planned on replacing the sprockets with the chain. So I had already ordered the small “cheaper” stuff like the roller bearing metal cover that was missing and screw. 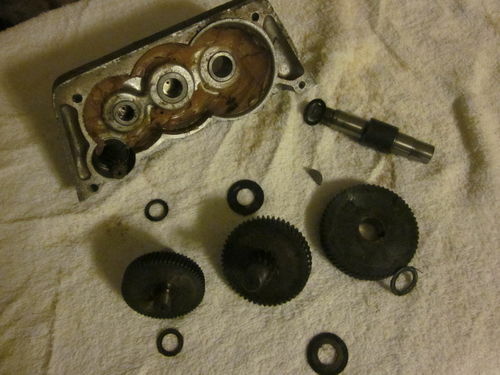 I did not think about replacing the roller bearings. Educate me! How are the bearing on this machine? Is it something I should go through the machine and re-lube them all up? Are they sealed bearing? Once again asking for advice.